I have been slowly learning a new Nia routine. I worked on it this morning then right before dinner I decided to do a few of the katas that I are challenging me. I knew that dinner would be easy because it is FINALLY soup weather in San Jose, California and I made Chinese Dumpling Soup last night and I was just going to add a little more broth. Well, I ended up adding a little more than that. After I first had this soup, which I first mentioned in my Ginger post, I wanted it again. I made it once and I wanted to post about it then because it is so good. But normally I only like to post recipes when I made adjustments so it can be more like my own and not like I am just copying someone else’s recipe, but I really haven’t made any adjustments to this soup. It is so good. This time I did add some mushrooms. Ya know, have you ever had that soup at a Chinese food restaurant with paper-thin mushrooms in it? 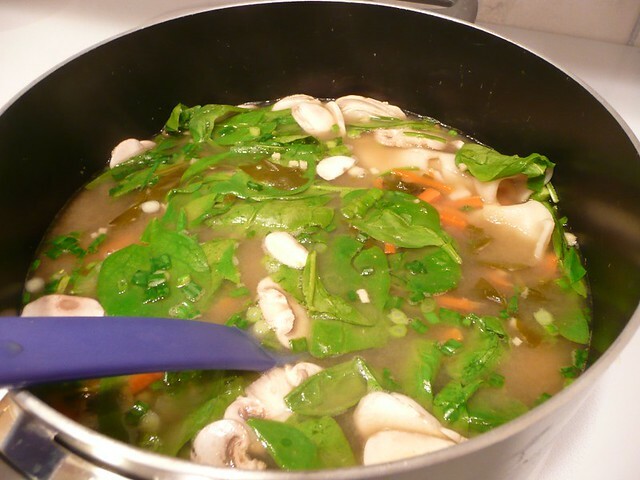 That is what I was thinking of so I sliced some mushrooms and put them in the original cooking and them more tonight when I added more broth and more spinach. This soup has so many flavors going on it is really a wonderful thing. I am going to make it and eat it without the dumplings (pot stickers). My hubby doesn’t want me to omit the pot stickers, but it is such good soup he will forgive me. I know he will. Heat the eight cups water, stir in the 8 teaspoons of bouillon. Add the ginger, soy, wine, vinegar, sesame oil, and sugar. Bring to a boil. Lower the heat and let simmer for about 10 minutes. Add the dumplings and cook for about 5 minutes. You might want to adjust the heat up a bit since the frozen dumplings will bring the temperature of the liquid way down. Add the carrots (I like them crunchy). Turn the heat down a bit and cook for about two minutes. Then add the spinach, sprinkle the salt in, and add the scallions. Let the spinach wilt, about a minute. Get your taste buds ready for some super yumminess and serve. Well, now that I have typed it up, the directions on the site are a bit different than mine, I am sharing with you the way I do it. But basically it is from the Food Network Cookbook and website. I don’t like my carrots really cooked so I add them after the dumplings where the site and the book say to add them before and cook them longer. The site also suggest cooking the soup without the pot stickers and just have them on the side. That is what I am going to do. If my hubby wants them in the soup he can put them in there. The way I cook them added them to the soup would add ANOTHER layer of flavor and probably make it better anyway. The soup is really, really, really easy and without the dumplings is has to be really low in fat. With the spinach you are getting a good amount of greens. YUM. This soup is really good. One of those foods that has you thinking about it. Well, the recipe this book came from is from a book I bought for my friend and she has made a few recipes in it for me and they have been really good. I would recommend this book to anyone that likes to use cookbooks. What made me get it for her is that there were simple recipes in it (she has kids) and because it shows “additional uses” for some of the ingredients you might not know what to do with. If you buy a can of tomato paste and use two teaspoons, it shows you other recipes in the book that also use tomato paste. I thought that was so cool because I often end up with leftover ingredients. As it turns out I love this book because it has this soup recipe in it and I love this soup. I hope you will try it and enjoy it too. If you do let me know what you think. This entry was posted on November 12, 2011 at 11:35 pm	and is filed under "Recipes", Food. Tagged: better than bouillon, Chinese Dumpling Soup, Chinese soup, easy soup, Food Network, Food Network cookbook, ginger, low fat soup, Nia, Nia California, Nia katas, Nia routine, Nia San Jose, pot sticker soup, San Jose Nia, soup weather, spinach. You can follow any responses to this entry through the RSS 2.0 feed. You can leave a response, or trackback from your own site. Angelia – It is soooo good. The combination of flavors is so amazing. We ate it for dinner three nights in a row. Every night it was just as good. The second night I added more broth, ginger and spinach. The third night I just added more spiniach. By the second night the potstickers were just falling apart. What I will do from now on is probably only put in a few the first night then either add them as we eat the left over soup or make them on the side. By the third night there was only a few left and I left them for my hubby, but I think that the insides had all come out and they were all broken up. I don’t know because I didn’t eat them. But the soup part is soooo good. Yes, yes, get Jason to make it. I think all of you will love it. You won’t have any left overs! mmmmmm….just stopped by to say hi,and I love your idea about cooking potstickers on the side and adding them in as you eat it – so many flavors, yes!! Yeah, there is a lot of things to do with the potstickers. As I was saying yesterday, I might just add whatever amount we are going to eat that first night into the soup. Because by the third night the potstikers are just a mess in the soup. But it is soooooo good. I think that cooking them on the side would add a whole other dimension of flavors. Thank you so much for taking time to look at this and comment. You are amazingly organized. I was so impressed. And sad. Love you!